The crow could be Britain’s least favourite bird. Its habits and behaviour are probably no worse than other members of the corvidae family who do not attract so much opprobrium. Perhaps it is the very uniform blackness of the bird which leads to the bad reputation. Folks might say they don’t have the redeeming feature of being colourful or pretty. 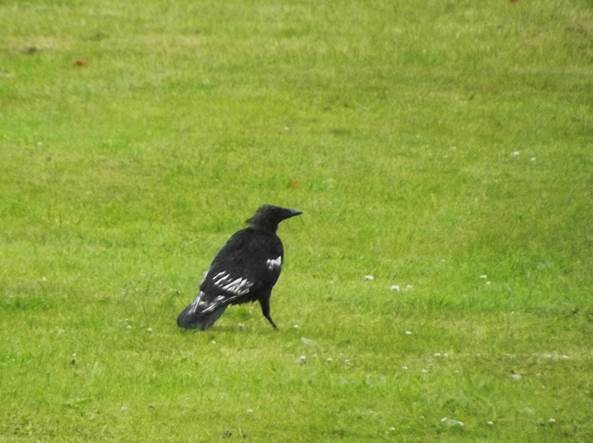 The other day I joked to my wife that we had a cross between a magpie and a crow on the back lawn. Here it is. Now this is a crow with some white feathers. It certainly makes it a distinctive bird. I quite hope it sticks around. By the way, birds like this are not particularly uncommon. We English are supposed to be obsessed by the weather. I rather think the French are as well. 2003 was the year of very high temperatures. At Limoges I took a photo of my car thermometer. Well there we have all the information. 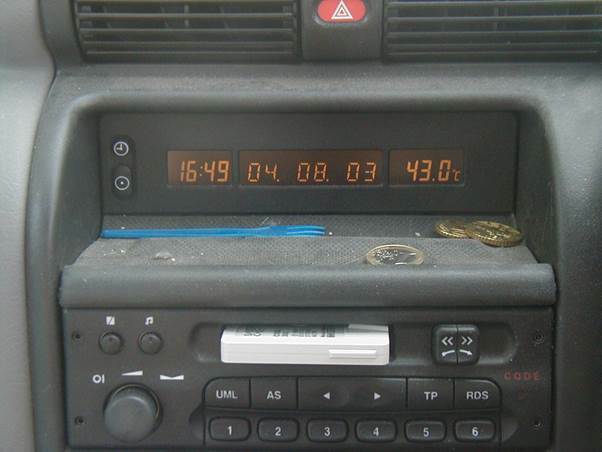 It was 4th August 2003 at just about ten to five and the temperature was 43oC. For those who prefer the Fahrenheit scale that’s almost 110oF. For any true nerds in the readership I suppose I’d better say it’s about 316K! For the second time in my life I was with people interviewed on French radio about the weather. This time it was my wife who was interviewed. She’s a much better French speaker than me. ‘How did we cope with the heat?’ was the gist of the interview. In 2003 it was too hot for us and for much of the time we sun dodged but when I came across this bunch of beautiful ladies, well, I couldn’t resist them. These are Limousin cows. The Limousin region surrounds Limoges so these were very much at home. Such elegant beasts, and I gather farmers find them ideal for beef production. At this time I wasn’t interested in seeing them on a plate. I just thought they were such pretty young things. But I am realistic. If these beasts did not serve humans well then they wouldn’t exist. I am no vegetarian although I think many people (possibly me) overdo the meat eating. Essentially, a plateway is a railway but with a difference. On a plateway the wagon wheels have no flange to keep them on the rail. Instead the rail (or plate) has a right angle bend all along its length to keen a plain wheel on track. 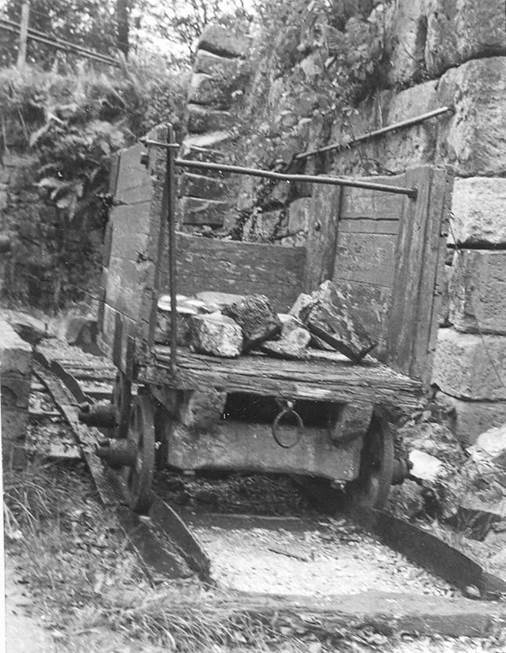 And here is a short length of battered plateway with a wagon. Now I’m going to have to confess to being a poor labeller of photos. This photo carries no date and no location information. So I’ll take a guess. Back in the fairly early 1970s we took part in a course on the industrial archaeology of Shropshire which was led by the redoubtable Barry Trinder. We visited the then nascent Blists Hill Museum and I reckon this is where I took this photo. I’m more than happy to be wrong, though, if anybody out there recognises this scene. Actually, I love the photo which definitely captures the pioneering spirit of 1970s industrial archaeology. It isn’t a modern reconstruction. Thomas Herbert Kesby was born in the year 1882 at Canterbury, Kent. He was baptised on the 20th November 1882. He was the tenth child of James Walter Kesby and Kate (nee) Mahon. Eight of his older brothers and sisters were still alive at the time of his birth. At the time of the baptism the family lived at 9 Notley Street, Canterbury. Thomas’s father, James, was a career soldier. He had served in many places, world-wide, but by 1882 he was past 40 and seems to have been involved with the East Kent Militia on training duties. In 1891, Thomas Herbert was living in Benenden with his family. He was aged nine and a scholar. 01.04.1916 promoted Lieutenant ) PRO records. In his private life, Thomas met and married Margaret Flinn. We do not know the date or place of the marriage (I’ll guess at a home leave for Thomas in 1915). What we do know is that the couple had a daughter, Margaret Maud Kesby who was born on 16th July 1916 at Smarden in Kent. 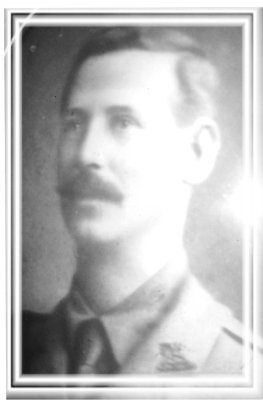 I think it most likely that Thomas never saw his daughter for the next date we have is the 15th September 1916, when Thomas Herbert Kesby was killed in the Longueval area of The Somme region. He was 34 and at the time he was attached to the 170th Battalion, Machine Gun Corps (Infantry). Thomas Herbert is buried in the London Cemetery Extension at Longueval. This cemetery was used after the armistice, bringing in bodies from other, scattered, burial grounds so we do not know just where Thomas fell. Pictures of the grave and cemetery were taken at about 7 am (French Time) on October 27th 2003. I commented, yesterday, that my great grandfather had spent time in a workhouse and suggested that his was nothing like the one at Southwell. 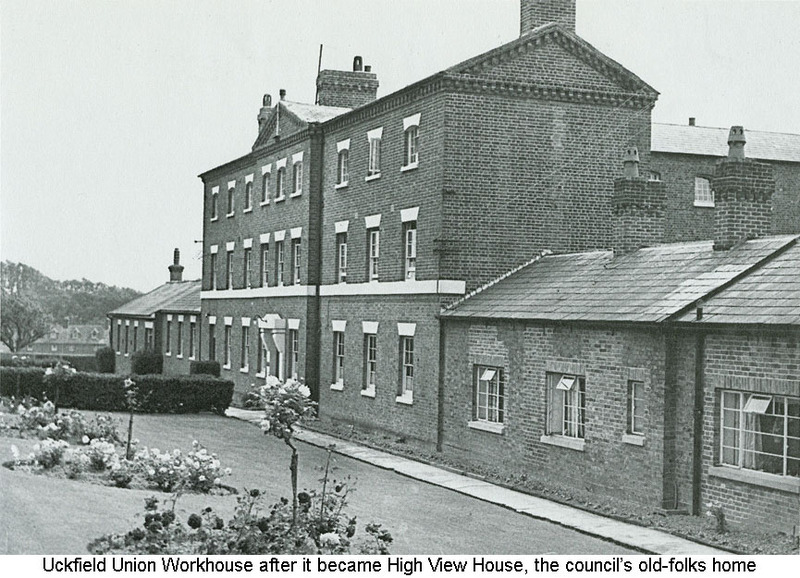 In fact, when I check up I find it was probably not so different for I realise that by the time great grandfather was a resident, the union workhouse had been built. It looked like this. This picture dates from the buildings time as an old people’s home. My Great Grandfather, James was born in 1851 and he was just about 4 when his parents, older brother and younger sister ran out of money and had to go to the poor house. This is what the records show. The stay may have seemed endless to young James and, no doubt to parents who would have been kept apart. But it was only 47 days. I wonder if James senior had an injury or illness and was unable to work. He had been an agricultural labourer before and was afterwards, living into the 1890s. Anyway, and no doubt thankfully, he was able to return to a home somewhere and continue labouring. He and wife Hannah had nine more children and, as far as I know were never inmates again although their address in 1861 was ‘The Old Workhouse’ at Buxted. My great grandfather spent time in a workhouse. It was a village workhouse and maybe not as big and forbidding as the large ‘union’ workhouses which came a bit later. But nonetheless, the knowledge that my forebear spent time ‘on the parish’ gives me an interest in workhouses. 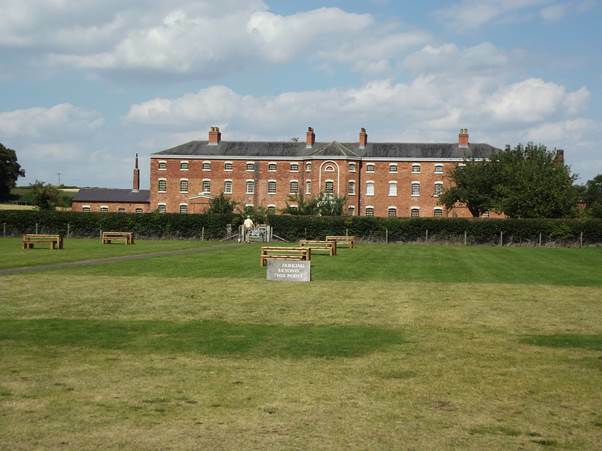 We recently visited a workhouse, in the care of the National Trust at Southwell which is between Nottingham and Newark. It is a large and imposing building but it only housed about 300 inmates which makes it quite small for a union workhouse. The union, by the way, means a union of parishes that contributed funds to one central workhouse. It was cheaper than each parish having its own! This was, of course, a picnic area for visitors. I’m sure residents at the workhouse had no such treats. Some would have worked in the kitchens or the laundry. Others, and this would have been unusual, would have helped grow produce in the garden. National Trust volunteers help to set the scene by dressing up as paupers and working in the same gardens. 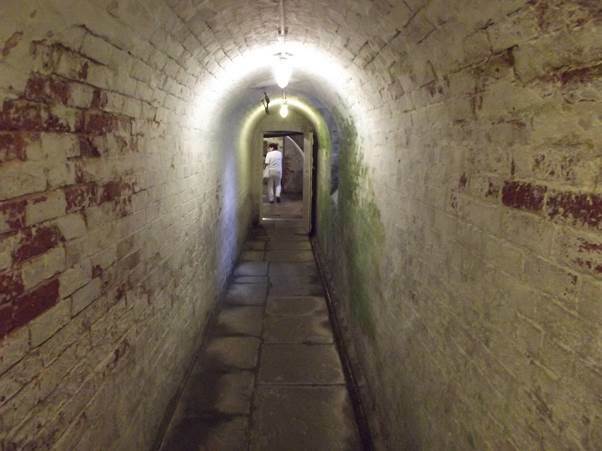 A passageway in the cellars. Apparently for much of the year it was wet down here. For we visitors there is electric light. Obviously in 1824 when this workhouse was built there was no electricity but we’d hope that when the building was still in use as a residential home for the elderly in the 1980s electricity had been added. 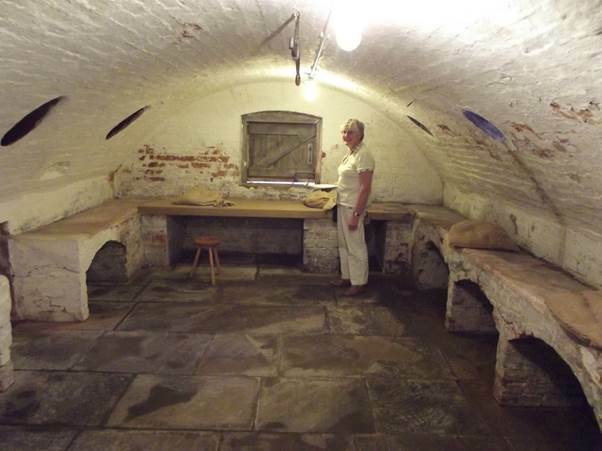 This cellar was used for storing potatoes. They had to be on the shelving because the floor could be ankle deep in floods. The notices hung up are poignant. Click on the picture for a larger version – and then remember that these residents are not criminals. They have just run out of money. And as workhouses went, this was liberal and enlightened. Here’s a meal sheet for children. Oh yes, plenty of children were accommodated in workhouses. Some started their lives in such an establishment. Sadly, many ended their short lives in the workhouse. Well we can see that the diet wasn’t all that varied with breakfast and supper being identical seven days a week. They got the meat and veg dinner three times per week and broth and more bread three times. It isn’t specific as to what kind of pudding made up the Saturday meal. An interesting visit, but almost most shocking was that the building was, in effect, still a poor home in the 1980s. This is not a physical revisit – merely that I have featured my childhood home before. But I can look back at a photo like this one and be amazed at the conditions it looks as though we lived in. Actually, it wasn’t as bad as all that. It was just that building works were going on at the time. Our house, a small and inconvenient semi is on the right. The house on the left belonged to the Langridge family and it looks as though I (for yes, that is me) am trying to say ‘hello’ to their dog which was called Lulu. The downstairs window facing the camera was our main living room. The one above it was my parents’ room. My dad’s new garage was being built in agreement with neighbours. Making our footpath house entrance shared enabled us all to get cars off the road. But the old shed is still standing behind the house and it looks like a heap of scrap near the camera. The photo dates from the early 60s. It does all look a bit squalid. 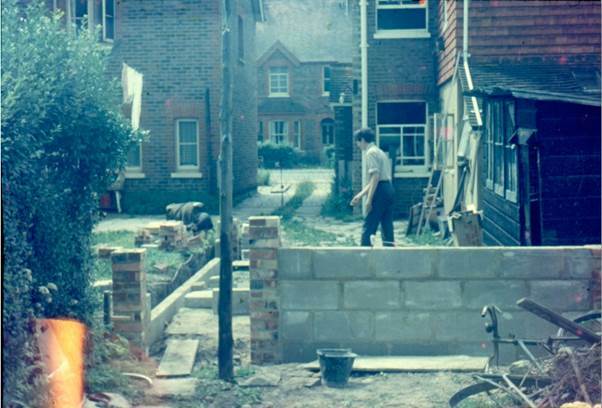 Later, after my mum had died and dad remarried he and second family moved to a more spacious house across the road. Stepmother, half-sister and family still live there so I do see this house from time to time. New owners decided to call the old place ‘Shambles’! I enjoy a good rainbow. But do you know, they used to cause ructions in our house. 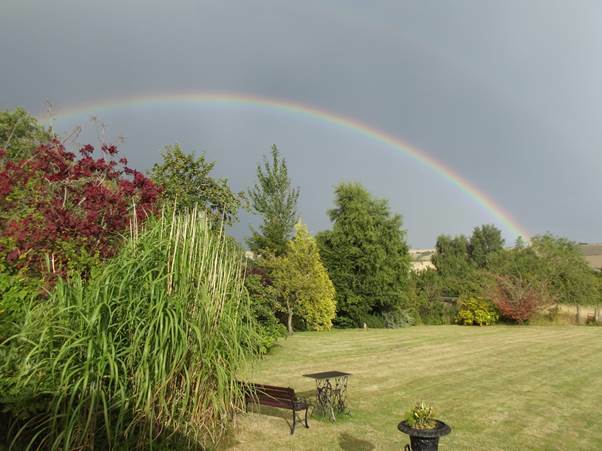 My dad was a scientist and was keen that we all learned what made rainbows happen. My sister, in that bolshie phase that teenage girls can go through griped about this. “Why can’t you just accept they are pretty without having to go into the science?’ She used to say. She seemed to imply that the rainbow lost some of its magic if it was understood; that somehow the rainbow was less beautiful for having knowledge and understanding. Well guess what? I was with Dad on this one. I like a good rainbow and have too many photos, probably, to prove it. I think they can be stunningly beautiful and I don’t think they are less beautiful to me because I think I understand why we see them. Anyway, the other day there was a pretty good one. Conditions were right in that a bright early evening sun shone, but dark rain clouds filled the eastern sky giving a fantastic backdrop for the bow. An outer bow is visible and we could see supernumery bands on the inside of the main bow. I’ve darkened the picture to show these things better. I have to say it is beautiful whether understood or not! Devizes has been my local town for many a year. There have been times, now long ago, when I lived there and worked there. Back in the early 1970s I was happy to wander around with a camera and snap images. These were often black and white which I processed myself and here is one of them. It dates from about 1972. Jennings Fair was and still is based in Devizes and so, not surprisingly there are fairs held on the green and sometimes, like on this occasion, in the Market Place. A big wheel no doubt provided riders with a good view down on the scene below but I never rode one in that location. This one is either being erected or taken down – I can’t remember which and it has to be said it looks quite flimsy in its incomplete form. Other rides can be seen and on the left is a typical fair lorry – heavy, reliable and slow. 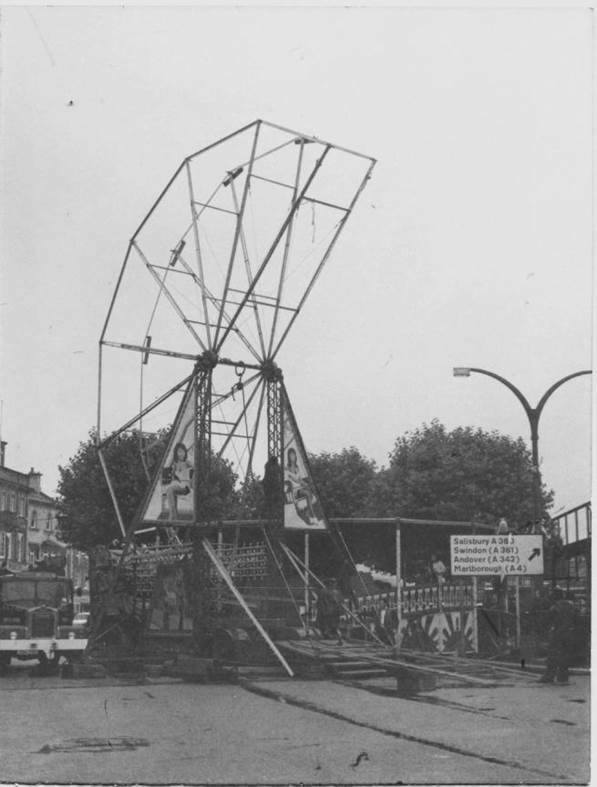 I think there are still fairs held in the Market Place in Devizes. In the back of the photo I took for yesterday’s post about a repaired chair I can see a little bit of another chair. This other chair has family history for it belonged to my great grandfather. Here is that chair. 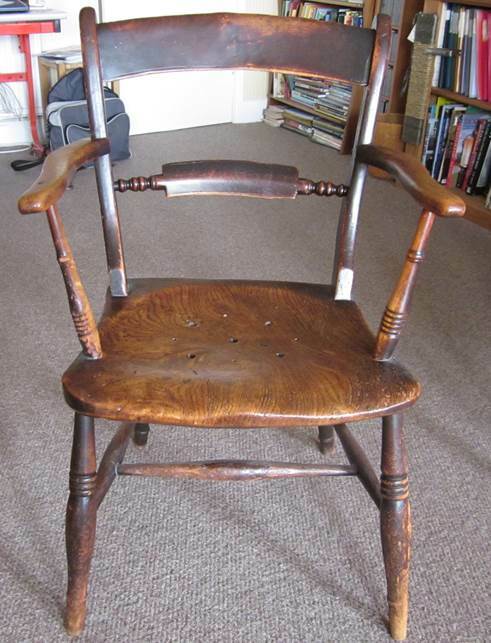 This is a good, sturdy cottage style chair and presumably dates from the 19th century. Great Grandad died in 1913 and he had been crippled with arthritis for years. My grandfather, born in 1889 couldn’t remember his dad being fit for work. In fact at the time of the 1901 census great grandfather had been away from his Sussex home and was actually in Bath, hoping the waters of that town would give him some relief. My dad, writing about the family in 1978 had this to say. My grandfather was crippled with arthritis before the turn of the century. Dad could barely remember him working. Eventually he was confined to a chair (now possessed by my daughter) with his hands and legs permanently bent so that he was buried in a deep coffin with his knees up. Evening and morning he was carted up and down stairs in the chair. He was in permanent pain and sometimes wished to die, eventually succumbing through weakness to a respiratory infection. Some years ago my sister passed the chair to me. Oddly, the picture I have of great grandfather clearly shows him in a different chair. He looks like a man in pain and arthritic. In his younger days he had a reputation as a fiery Baptist preacher. Presumably those days were over when this photo was taken. But at least here he has got outside in the sunshine. Great Grandad’s memory lingers on and his old chair is in daily use now.